Paid sick days are the responsible way to prevent the spread of disease and keep everyone healthy. Paid sick days help prevent the spread of disease by encouraging sick workers and children to stay home – away from co-workers, schoolmates, and customers. Ensuring people don’t have to work while sick means they can care for their health needs without losing a day’s wages, or their job. With paid sick days, people can seek preventive care and early treatment for themselves and their family members – and that keeps us all healthier. Paid sick days also promote healthier businesses and workplaces by preventing the spread of food-borne disease, and boosting employee productivity and morale. Grocery and restaurant workers are on the front lines of food safety. Yet one in four grocery workers report coming to work sick because they don’t have paid sick days, and 78% of accommodation and food service workers don’t earn paid sick days. Paid sick days help prevent the spread of disease on the job, but 55% of retail workers and 29% in health care don’t have sick leave. They either work while sick, or they lose pay – or worse, their job. 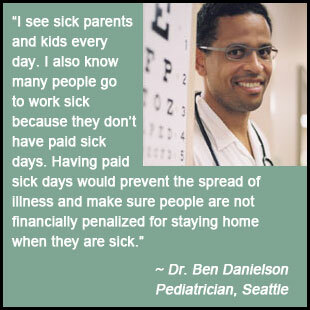 For 28% of school-age children in Seattle – 13,000 students – all parents work jobs that do not provide paid sick days. Parents without sick leave are less likely to stay home with an ill child, sometimes being forced to send a sick child to school, or keep an older child home from school to watch a sibling. Childcare workers and caretakers for the elderly are among those who often have no paid sick days. This puts some of the most vulnerable people in Seattle at risk. Learn more about the social, economic and health implications of paid sick leave in Seattle in this report: “Evaluating Paid Sick Leave: Social, economic and health implications for Seattle“.